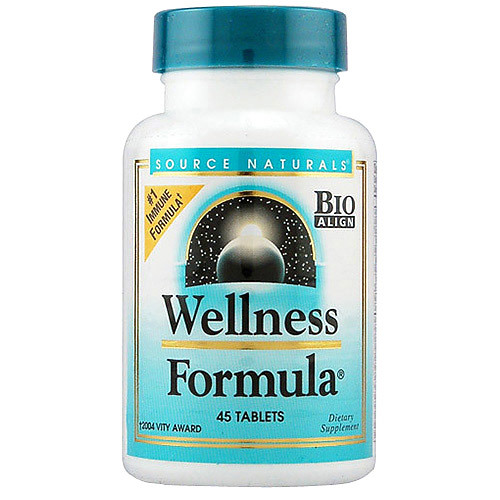 Source Naturals Wellness Formula contains a powerful combination of herbs, antioxidants, vitamins and minerals formulated to support your wellbeing. The Wellness Formula products are designed to support the immune system when under physical stress. Source Naturals was created to support each individual`s potential to enjoy optimal health. Source Naturals has subsequently introduced numerous award-winning formulas, recognized for their excellence in independent surveys and nutritional analyses. Garlic Bulb, Propolis Extract, Echinacea purpurea Root Extract, Elderberry Fruit Extract, Aromatic Solomon`s Seal Rhizome, Horehound Aerial Parts Extract, Olive Leaf Extract (10% oleuropein), Andrographis Aerial Parts Extract (10% andrographolides), Isatis Root Extract, Eluethero Root Extract, Elecampane Root, Citrus Bioflavonoid Complex, Cinnamomum spp. Bark Extract, Kudzu Root Extract, Mullein Leaf Extract, Goldenseal Root Extract, Angelica Root Extract, Astragalus Root Extract, Isatis Leaf Extract, Elecampane Root Extract, Pau D`Arco Bark Extract, Cayenne Fruit, Ginger Root Extract, Grape Seed Extract (Proanthodyn), Stearic Acid, Modified Cellulose Gum, Silica, Acacia Gum. For best results, begin taking Wellness Formula tablets at the very first signs of imbalances in your wellbeing. During imbalance, take 3 tablets every 3 hours. Do not exceed 15 tablets daily for a maximum of 10 days. For wellness maintenance, take up to 3 tablets daily. Do not use if pregnant, may become pregnant or breastfeeding. 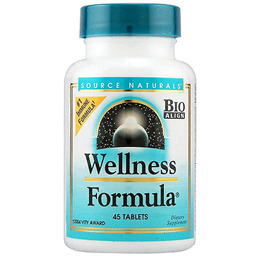 Below are reviews of Source Naturals Wellness Formula - 45 Tablets by bodykind customers. If you have tried this product we'd love to hear what you think so please leave a review.